Powerball has upgraded to offer big jackpots and more overall winners! Here is a summary of the changes. 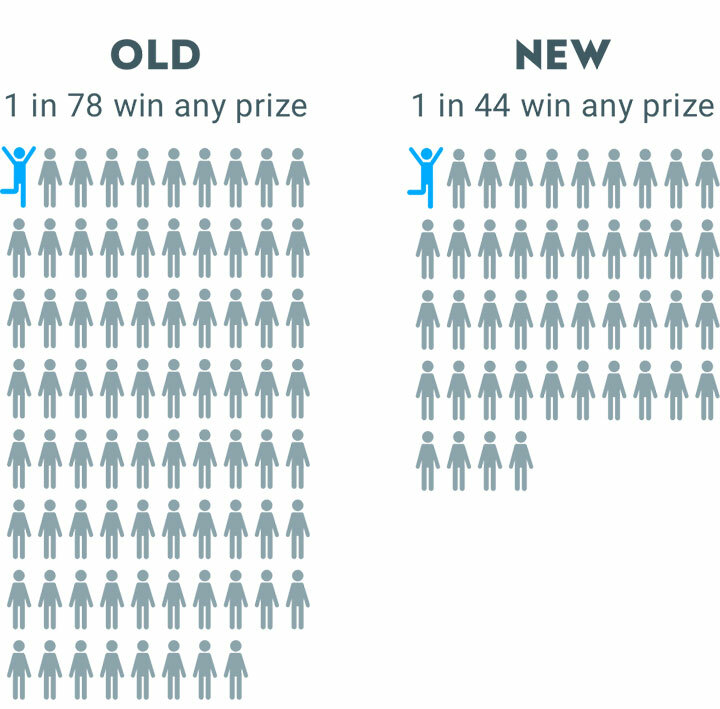 We’re improving the odds of customers winning any prize from 1 in 78 to 1 in 44. And of course, if you have any questions you can contact our friendly Customer Support team Monday to Saturday 8:30AM to 7:30PM. To get your tickets and see the latest for yourself, head to our website. So, there is less chance of winning a larger amount at an increased cost. I think I’ll stick to lotto and the lotteries. This change is based on unrealistic greed. At Oz Lotteries we value your feedback and will pass this on to the relevant team. The Powerball game has recently been supercharged to offer big jackpots and more overall winners, to make these changes possible the price has increased by 30 cents per game. We apologise for any issues these changes may have made. Translation: We’ve changed the game to ensure nobody wins first division for months at a time. YAY! Thank you for your feedback, Jeff. With the new Powerball, we’re improving the odds of customers winning any prize from 1 in 78 to 1 in 44. If you need more information about this, you can email us at support@ozlotteries.com. Have you even thought of us who find it hard to make ends meet already. I only played P’ball as I can not afford more and some weeks I had to miss out as money was too tight, now you have raised the fees! So now, I might have to give that golden goose dream away !!!!! The reason for the increase is due to adding an additional number to the mains and also decreasing the mains from 40 to 35 numbers with these changes there is an additional division prize pool. These changes are from Tatts and there is a minimum you can play of 4 games. Whenever it does suits you to play feel free to but you also have the choice of taking a break if you need you can please contact us on 1300 188 911. You clearly need to update your app as it’s telling me that I won a prize in division 6 of $69.25 only to get an email telling me I only won $17.30. That’s quite a difference and until I got the email I believed I was getting the higher amount. Thank you for your comment. We would love to help you figure out what is going on there, could you email us at support@ozlotteries.com with the email address that you used to register? We can then get back to you with our findings.